Icknield Street (Ryknild Street) - office23s jimdo page! Sutton Park, in Sutton Coldfield, Birmingham, England, is one of the largest urban parks in Europe covering 970 hectares (2,400 acres), with a mix of heathland, wetlands and marshes, lakes, extensive ancient woodlands and public amenities such as resterants and golf courses. Rotary Coppice. Presented by the Rotary Club of Sutton Coldfield to commemorate the Silver Jubilee of H.M. Queen Elizabeth. 1952-1977. Several earth mounds have been discovered in the park dating to pre-Roman times. Amongst these mounds are cooking sites, identifiable from the charred and cracked stones within them. The Sutton Park fire of 1921 uncovered more mounds and broken stones, leading to excavations by the Birmingham Archaeological Society in 1926 and then publishing their report on their findings in 1927. 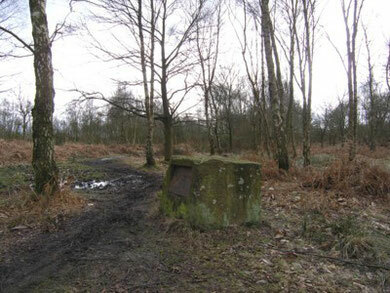 Signs of a developing settlement are also located in Sutton Park, near Blackroot Pool. Noted first in 1904 by Midgley, they were described as earthworks "untouched by the plough". Peat-cutting, near Rowton's Well during World War II, recovered flint arrowheads at the base of the peat. Icknield Street showing its metaled surface. The park contains a preserved section of the Icknield Street, a Roman road. It runs from the Fosse Way at Bourton on the Water in Gloucestershire to Templeborough in South Yorkshire. (The road passes through Alcester, Studley, Redditch, Metchley Fort, Birmingham, Lichfield and Derby). It acquired the name Icknield Way during the 12th century, but it is now called Icknield Street (or sometimes Ryknild Street) to distinguish it from the older Icknield Way, an Iron Age trackway running from Norfolk to Dorset. Much of the route of the Icknield Street is still used by modern roads, most notably the A38 from Lichfield to Derby. The noticeably cambered road enters the Park near the Royal Oak Gate and exits towards the aptly-named Streetly; it is still possible to walk the road. In 1909, two Roman coins were discovered in the park. The Queen's Coppice, planted in 1953, now covers the site of an ancient tumulus, from which a stone 'coffin' was dug out by antiquarians in 1808. Near Blackroot Pool are the earthworks of an ancient encampment, the origin of this is not known - possibly it was a hunting lodge and it may have been Roman, Mercian or Norman (or even all three, over time). The park was a Royal Forest of the Anglo Saxon kingdom of Mercia at around the 9th century. By the early 1100s, it was in use as an established Norman medieval deer park. The land was given to the people of Sutton Coldfield by King Henry VIII in 1528 after Bishop John Vesey, a friend of the King, asked for it as a present to the people of Sutton Coldfield. 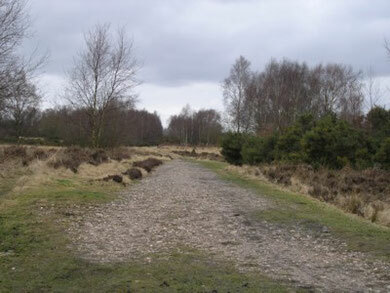 The charcoal burning that took place in the Park is thought to have given Sutton Coldfield the second part of its name. Wyndley Pool is the oldest in the Park, perhaps dating from the 12th century or even earlier. The house of the Royal Steward sat on the bluff overlooking Wyndley Pool. Keeper's Pool and Bracebridge Pool date from the 15th century. Powell's Pool, Longmoor Pool, and Blackroot date from the 18th century, and were created to run watermills. There was another pool at Boldmere, now outside the park, but this has since vanished. Near Blackroot Pool are earthworks usually described as an 'ancient encampment' whose age, origin and function are not known. Located on the other side of the railway from Blackroot Pool, this is a fascinating enigma. It is a large oval enclosure measuring 34m by 28m but unfortunately too badly damaged for positive identification. It may date from the Iron Age and is possibly evidence of a settlement two and a half thousand years old. The area of Ladywood, at Four Oaks, was taken for housing, but in exchange the Meadow Platt area near the town was added to the Park, thus allowing the construction of a new Park Road access from the town. A rail line, the Sutton Park Line, was built through the Park in 1879 and the Park had its own station. The advent of the railway, and the new town entrance, greatly increased the number of visitors to the Park. The Park's own dedicated station was closed in 1964, and the line now only serves goods trains. The Butts, constructed in 1881 & closed in 1893. The Butts were constructed in 1881. Here targets were set up for a rifle range in the Longmoor Valley. Behind the trench stands a huge man-made mound raised up to stop any stray bullets. 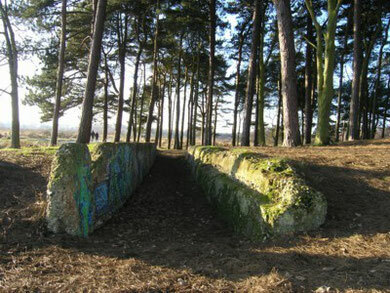 The concrete trench was used to shelter the men who marked the targets. The Butts were closed in 1893 when someone out walking in the Park reported a near miss. During the First World War the Birmingham City Battalion of the Royal Warwickshire Regiment trained here, a tablet erected after 1920 not far from Town Gate commemorates this military use: "This tablet is erected to commemorate the occupation of this park from 1914 to 1920 by His Majesty's troops. The park was placed at the disposal of H.M. government entirely free. Over 50,000 of H.M. troops occupied the various camps constructed. The Birmingham city battalions of the Royal Warwickshire Regiment received their training here and were followed by other units. For a considerable period the camps were used for convalescent officers and men -- and New Zealand troops also were in occupation prior to their return home. The council of the royal town received the thanks of the War Office for their patriotic action." During the Second World War the park was used by regular troops and by the Home Guard. Additional camps were built to house foreign nationals, then for U.S. forces prior to D-Day, and finally for German and Italian prisoners of war. Parts of the park were used for testing tanks. In 1957, the 50th anniversary of Scouting was celebrated when the 9th World Scout Jamboree was held in the park, with participants from all over the world. The event is commemorated by a short stone pillar in the centre of the park.